Solitaire, originally called Klondike, is a classic card game that gained enormous popularity in the modern world due to its inclusion on standard PCs from the 1980s onwards. As the name suggests, Solitaire is a single player card game and is a great way for players to build skill and concentration for use in other card games. The game of solitaire requires ability, strategy and a little bit of luck, and can provide hours of entertainment. Solitaire has the potential to be impossible to solve, which adds to the complexity and fun of playing. Solitaire is played with a standard desk of 52 playing cards, excluding the Jokers. Playing online means that cards are automatically shuffled and dealt, however if playing in real life, cards need to be shuffled thoroughly. The rank of cards in Solitaire is: K (high), Q, J, 10, 9, 8, 7, 6, 5, 4, 3, 2, A (low). From the deck, 28 cards are dealt into seven piles (known as the tableau), with the number of each card per tableau increasing from 1 to 7, from left to right. For example, the first pile will have one card, the next pile will have two cards, the next three cards, and so forth. All cards are dealt face down except for the top card in each pile which is dealt face-up. Above the tableau there will be four foundation piles, which can only be created when an Ace card becomes available. Upon the appearance of an Ace, the foundation pile can then be built upon with cards of the same suit, in ascending order from Ace to King. For example, the appearance of the Ace of Hearts card can be built upon with a Two of Hearts, followed by a Three of Hearts, etcetera, with the pile becoming complete when it has risen all the way from to the King of Hearts. All remaining cards not dealt to the tableau become the draw pile, and are placed in a face-down pile in the upper left hand corner of the game. The draw pile is essentially your back-up for when no other cards in the tableau are available to be played. Many variations of solitaire offer different layouts when it comes to the draw pile, with the most common online versions offering either the one card or three card variations (explained further in our ‘How to Play Solitaire’ section below). The aim of Solitaire is to build up each foundation pile in suit and ascending sequence in as few moves as possible. Once the whole pack of cards has been built into the four foundation piles, the game has been won. The only cards available for play are the top cards that face-up on each of the tableau piles and the face-up card on top of the draw pile. First, look to see if there are any Aces showing. If you have an Ace available, use this to start your foundation pile of that suit. Cards can be shifted between each tableau to by arranging them in descending order with alternative colours only. For example, a black Eight showing on one tableau can be moved to another tableau showing a red Nine, or a red Jack to a black Queen, etcetera. Upon shifting the last face-up card from a tableau pile, you can now flip over the top face-down card to reveal it. Once you’ve cleared an entire tableau pile, that space now opens up the possibility to start a whole new tableau, but you can only create a brand new tableau pile with a King. When you do so, this tableau is now ready to be built upon in descending order with alternating colours, so if you’ve shifted a red King over to create a new tableau, you will now require a black Queen to follow, followed by a red Jack, etcetera. You may also move multiple cards from the tableau at once, provided they are in the correct descending and alternating colour order. For example, if the tableau shows a face-up Seven of Hearts and another pile from the tableau already has a build-up starting from a Six of Spades going all the way down to a Three of Hearts, the entire row from the Six to the Three can be shifted over to the tableau showing the Seven of Hearts. Making moves like this allows for a greater chance to reveal new face-up cards in the tableau, and is a very effective way to manipulate the board. Cards can be moved from any of the tableau to the corresponding foundation whenever possible. For example, if a foundation pile is currently showing a Three of Clubs, and a Four of Clubs has been revealed in any of the tableau piles or draw card pile, then it can be moved up to the foundation row. This foundation is now ready for the Five of Clubs whenever it becomes available, and so on. Note: to move the Four of Clubs to the foundation pile, it would need to be the top card of any tableau pile, or the top card turned over from the draw pile – cards under the top face-up card cannot be shifted until they themselves become the top card. The draw pile in the upper left-hand corner should be utilised only when there are no cards on any of the tableau piles available to be moved to other piles (tableau or foundation piles). If you can’t make a move the tableau, you will need to revert to the draw pile by flipping the top face-down card over to reveal it in a new adjacent pile (known as the waste pile). This waste card is now available to be played. If that card still doesn’t open up any possible moves, another card from the draw pile can be flipped face-up on top of the last, and so on, until a card appears that is able to be played. If the draw pile runs out, do not shuffle it, but simply turn the waste pile back over and begin again. Note: the three-card draw pile variation is played in the same manner, however instead of one card being flipped over at a time, three cards are flipped over at once to create the waste pile, and only the card on top of the three card pile is available for play. If the card on top is played, the card below now becomes available, and so forth. This version increases the difficultly level of the game. Avoid drawing from the draw pile until you are absolutely certain there are no moves available from the tableau piles. Aces and Deuces should always be played to the foundation piles as soon as they appear in order to build these piles as quickly as possible. Cards should generally be moved between tableau piles only if they are going to free up a face-down card. Try to avoid playing a card until you’ve considered the instant gain of that move. Players often find themselves stuck by transferring a card for the sake of transferring, the moment it becomes available, before considering how this might hold them back from any future moves. Most online Solitaire games are played with a score tally, however if playing with your own deck of cards, scoring is not necessary unless you wish to add another dimension to the game. – Recycling/finishing the draw pile when playing by flipping over one card at a time: -100 (minimum score cannot go below zero). If a card from the waste pile is first moved to the tableau, and then to a foundation pile, a total of 15 points are awarded, so if possible, no cards should be moved directly from the waste to a foundation pile. You can also receive bonus points based on how long it takes you to finish the game, if playing a timed game. The standard formula is 700,000 divided by the total game time in seconds. Also, for every 10 seconds of play, two points are deducted. The highest possible score in standard scoring Solitaire is 24,113. Solitaire can be played online at a huge range of sites for free play like the popular Internet gameing site Zigiz.com. If you like Solitaire, you will most likely enjoy the range of table card games like blackjack, poker and baccarat that can be played for free or real money online at www.RoyalVegasCasino.com. Use Solitaire to sharpen your skills and strategies before heading on to try your luck at these other popular card games. Klondike is a sophisticated game with a long history. While the exact origins of the game are not entirely known, the game which became known as Solitaire first makes an appearance in written form in a German book of games dated 1783. The game was then described as a competitive card game that could be played alone or with others, but gained popularity as a solo game of patience due to the fact it could be used to practice individual skills for other competitive card games. Also called Patience or Success in different parts of the world, Solitaire really gained popularity in the 19th century as it became a favourite amongst English and French society, with aristocratic names like Prince Albert being known to play. It’s also widely understood (but historically inaccurate) that Napoleon spent a lot of time playing solitaire while in exile. 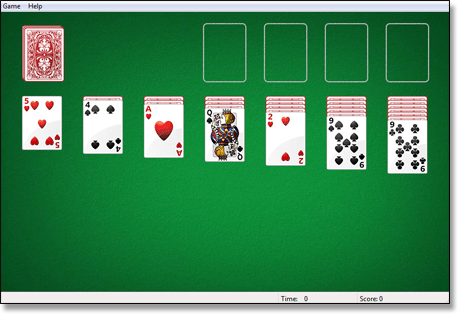 The inclusion of Solitaire on PC’s has kept the game popular in today’s technological world. 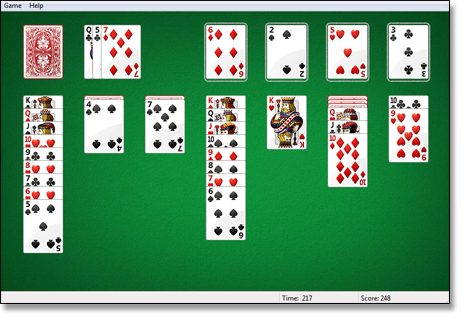 The Microsoft Windows version of solitaire first appeared in 1990 and is now a requisite staple on any Windows platform and is now available on desktop computers, laptops, mobile phones and tablets. There are currently over 150 different versions of Solitaire known to be played around the world. i still don’t understand what it means when the tip is to recycle remaining cards?! please tell me how to recycle cards when playing solitare. Can you reuse cards from the foundation file?